The Bristol Blenheim was initially designed in response to a 1934 challenge issued by Lord Rothermere, owner of the Daily Mail newspaper, to the British Aircraft industry to produce a fast six passenger aircraft capable of re-capturing the title of fastest civilian aircraft in Europe from the Germans. The Bristol Aeroplane Company tasked their designer with developing such an aircraft and he did so by modifying his existing Type 135 design into the Type 142. The Type 142 first flew in April 1935 and proved to be faster than any of the RAF's current fighters such as the Bristol Bulldog - a military version was requested with a bomb bay and defensive armament. The RAF's new production Bomber was initially called the Bristol Bolingbroke but was soon re-named the Bristol Blenheim. The Bristol Blenheim entered operational service with the RAF in 1937 in it's Mk I variant, a Mk II long range reconnaissance version followed with a increased visibility nose/cockpit, a lengthened variant, the Mk III, entered service the following year. The best known and most numerous Blenheim variant was the Mk IV, this effectively combined the modifications found on the Mk II and Mk III in a single airframe. 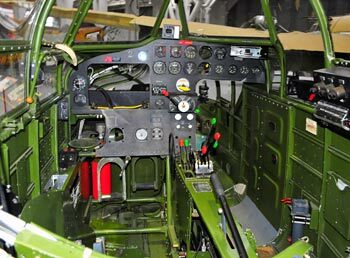 It is of note that the Bristol Blenheim Mk IV was made under licence by Fairchild Aircraft Ltd in Canada, their aircraft reverting to the bomber's original name "Bolingbroke". The Bristol Blenheim was retired from the RAF as a front-line bomber in 1944, the last air-force operating the Bristol Blenheim was the Finnish Air Force who operated them until 1956, although they had been relegated to target tug duties by that time. This picture of Bristol Blenheim IV is Copyright © June 2014 Siteseen Ltd. We only authorise non-commercial picture use and particularly encourage their use for educational purposes. This Bristol Blenheim IV picture is not in the Public Domain. 3) Use of this Bristol Blenheim IV picture, or any of our pictures on websites re-distributing copyright free material is strictly prohibited.